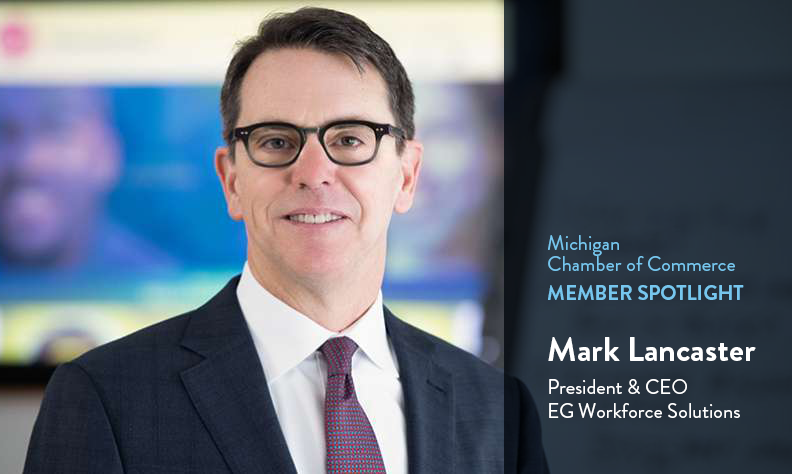 As a longtime member of the Michigan Chamber of Commerce, our President & CEO, Mark Lancaster, sat down with the Chamber to discuss what inspires him and the rest of the EG Workforce Solutions team to come to work every day. With more than 20 years in his role, Mark emphasizes the importance of training and development to support the enrichment of the communities EG serves. He supports helping people succeed in the workplace by serving on several community boards, including Talent 2025, a West Michigan initiative. It’s no secret that employers across the country are struggling to find quality talent. In order to create fulfilling connections between candidates and employers looking to grow their teams, Mark recognizes that EG candidates are also valued EG customers. In order to grow relationships with qualified job candidates, EG has evolved its emphasis from recruitment activities to talent acquisition expertise. In addition to Mark’s involvement with the Michigan Chamber of Commerce, CFO, Linda Miller, and Director of Human Resources, Kurt Wagner, currently serve on boards in support of the Chamber’s mission. Mark believes their involvement allows EG to act as a better advisor regarding policy changes that may impact customers. To read the full text of Mark’s spotlight, visit Michigan Chamber of Commerce.